It is a quiet, uneventful Saturday in Doncaster. Nick Aten, and his best friend Steve Price  troubled seventeen year olds  spend it as usual hanging around the sleepy town, eating fast food and planning their revenge on Tug Slatter, a local bully and their arch-enemy. But by Sunday, Tug Slatter becomes the last of their worries because somehow overnight civilization is in ruins. Adults have become murderously insane  literally. They're infected with an uncontrollable urge to kill the young. Including their own children. As Nick and Steve try to escape the deadly town covered with the mutilated bodies of kids, a group of blood-thirsty adults ambushes them. Just a day before they were caring parents and concerned teachers, today they are savages destroying the future generation. Will Nick and Steve manage to escape? Is their hope that outside the Doncaster borders the world is 'normal' just a childish dream? 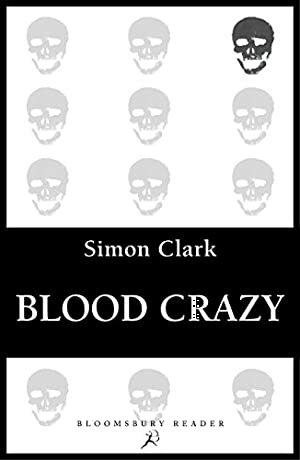 Blood Crazy, first published in 1995, is a gripping, apocalyptic horror from Simon Clark. Track It. This book has been $4.65 within the past year. Log In to track Simon Clark on eReaderIQ. to be notified each time the price drops on any book by Simon Clark. to stop tracking Simon Clark. We started tracking this book on March 15, 2016. This book was $4.65 when we started tracking it. The price of this book has changed 20 times in the past 1,132 days. The current price of this book is $7.01 last checked 3 months ago. This lowest price this book has been offered at in the past six months is $5.42. This lowest price this book has been offered at in the past year is $4.65. The lowest price to date was $4.65 last reached on January 24, 2018. This book has been $4.65 8 times since we started tracking it. The highest price to date was $7.99 last reached on December 4, 2018. We last verified the price of this book about 3 months ago. At that time, the price was $7.01. This price is subject to change. The price displayed on the Amazon.ca website at the time of purchase is the price you will pay for this book. Please confirm the price before making any purchases.